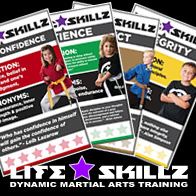 Sign Up for Access to LifeSKILLZ below! After teaching what I’ve discovered to hundreds of school owners worldwide, I went to work creating a done-for-you system that you could just pick up and follow. It covers all of the problems most schools face with kids, and gives you a simple solution that WORKS. If you have any questions at all, don’t hesitate to reach out to my team and me. We’re here to help. Email Support below to schedule a phone call! 2019 © SKILLZ All Rights Reserved.